A provincial train station along the way. I am in the Thai border town of Pedang Besar, having crossed over from Pedang Besar, Malaysia. I’ve been directed down the road by a police officer to catch the bus to Hat Yai. As I’m walking past a large covered platform accommodating three large women, one of them asks, “Where you going?” I tell them and am told to sit down. This is the bus stop. I am offered sliced papaya, which is delicious. They ask me if I speak Thai, and I respond in the negative. But that doesn’t stop them from speaking to me in Thai for the next ten minutes, giving stilted translations of what they’re saying along the way. I take out my phrasebook and pretend to study it. Motorbikes continually pull up to the platform, plastic bags full of bottles of name brand whiskey emerging from their compartments. I watch the women re-package, box, and eventually load them into a van with a host of other boxes full of I don’t know. The women banter and seem to be very popular with people riding motorbikes. Another woman shows up and gives me freshly fried banana slices. These are quite good. She offers me an apple, I decline, but she insists. I eat an apple. Finally, she offers me a fruit that I’ve never seen before. Before I try it I look at it quizzically, which is amusing for everyone. I board my bus to Hat Yai. I don’t have any Thai Bahts, and trying to explain that I need to exchange money in Hat Yai is fruitless. They accept my Malaysian Ringgits, and I am given my change in Baht. The windows are open as we cruise down the highway, past pictures of the beloved Thai King. 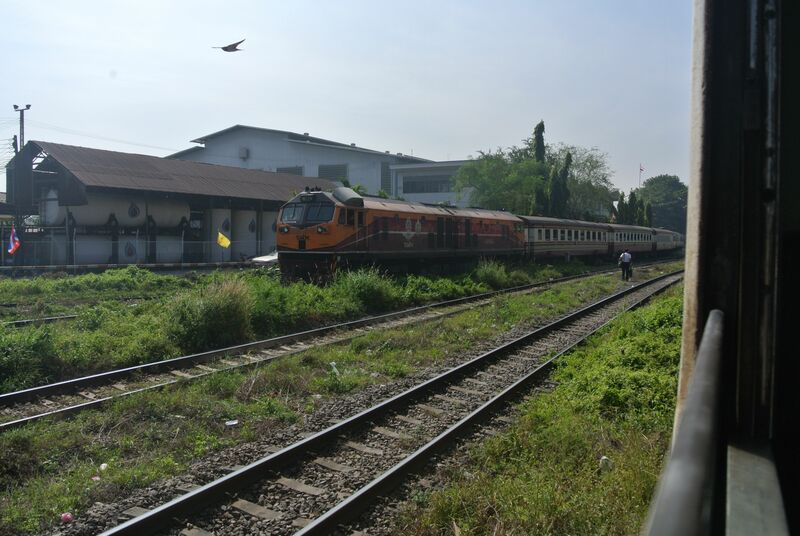 After around an hour we reach Hat Yai and I look up the word for train in my phrasebook. I’m told to get off and walk down a major street. I buy a bag of cashews with my fresh Baht and eventually find the train station. Soaked fields right before it rained again. When I inquire about a ticket to Bangkok, the clerk tells me that a train is leaving NOW, and acts rushed. I am buying a ticket for the train that is scheduled to depart at 2:30 in the afternoon at the present local time of 3:30 pm. The train leaves the station around 4. In my second-class sleeper car (555 BT/about $18) the windows are open and fans rotate overhead. Until the sun goes down I look out the window and enjoy the breeze in my face as we pass by farms, cross over muddy rivers – sometimes with people wading in the water – and livestock, birds, and dogs. Unfortunately it starts to pour so we have to put the windows up, as the surrounding landscape is drenched. Vendors walk up and down the aisles selling food and drinks. The attendant sets up the beds: mine a top berth, windowless. Despite the size limitations – this bed was not designed for someone 6’ 2” – I get some sleep, waking up from time to time as the train violently rocks during stretches of higher speeds and worn tracks. We roll through the outskirts of Bangkok in the late morning, clothes hanging to dry outside of houses made of corrugated sheet metal. Power lines go every direction, satellite dishes on top of seemingly every structure. Outside of the Bangkok train station is not much of a site. Mostly clogged streets and drab buildings. Though, the station is not far from ritzier parts of town. I eventually maneuver my way to my hostel near the infamous backpacker district. This entry was posted on November 28, 2014 by alexjparton. It was filed under Asia, Malaysia, Thailand, Travel and was tagged with asia, backpacking, Bangkok, border crossing, bus, contraband, Hat Yai, malaysia, SE Asia, Thailand, tourism, tourists, train, travel, whiskey.